Are you looking to buy the strongest k-cup coffee you can find? I love the ease and convenience of the Keurig system, but I am not a big fan of some of the weak coffee many of the k-cups produce. 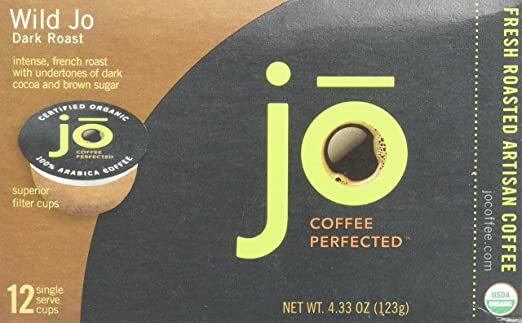 By far and away the most popular extra strong Keurig coffee pods we sell are the pods from Jet Fuel, Death Wish, and to our surprise WILD JO, each of which we’ve briefly reviewed below. In fact below, I’ve listed five of the strongest Keurig coffee pods you can buy and each company has a few different roasts to choose from. My personal favorite is the Afterburner Dark Roast k-cup from Revv, which is rich and full bodied. Lower on this page we’ve reviewed this flavor and their other dark roast variety which tends to be slightly more popular with our customers. As is always the case, brew these with the smaller cup option on your machine and you’ll be getting the strongest coffee possible from your Keurig. You can read more about making stronger coffee with any k-cup by clicking here. Now let’s get on with the reviews. Here are some of the strongest k-cups for sale today. Click through each link for pricing and product details. I’ve provided my own notes for each option below for your convenience. Any Death Wish coffee review would be incomplete without mentioning the fact that this company has probably the best reputation in the market for super strong coffee. They make a variety of coffees and they are all well reviewed. As for any Death Wish k cup they are about as good as they come and they pack a punch. According to Consumer Reports Death Wish coffee contains four times the caffeine of typical coffee grind regardless if it’s packaged in a k-cup capsule or not. These pods are their base flavor and roast profile and as such they are very popular among most coffee drinkers. 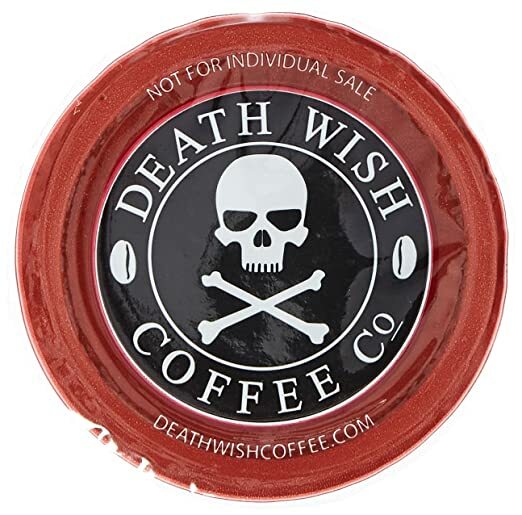 Death wish coffee pods are all among the strongest coffee options out there and they also contain more caffeine than most every other brand out there too. Deathwish makes certified organic coffee as you would expect and these pods are even compatible with all Keurig brewers including 1.0 and 2.0 machines. As always, if you always brew the smallest cup possible from your brewer then you’ll get the maximum out of these pods. For Deathwish coffee I think pricing is attractive here on Amazon especially if you buy the larger pack of 50. 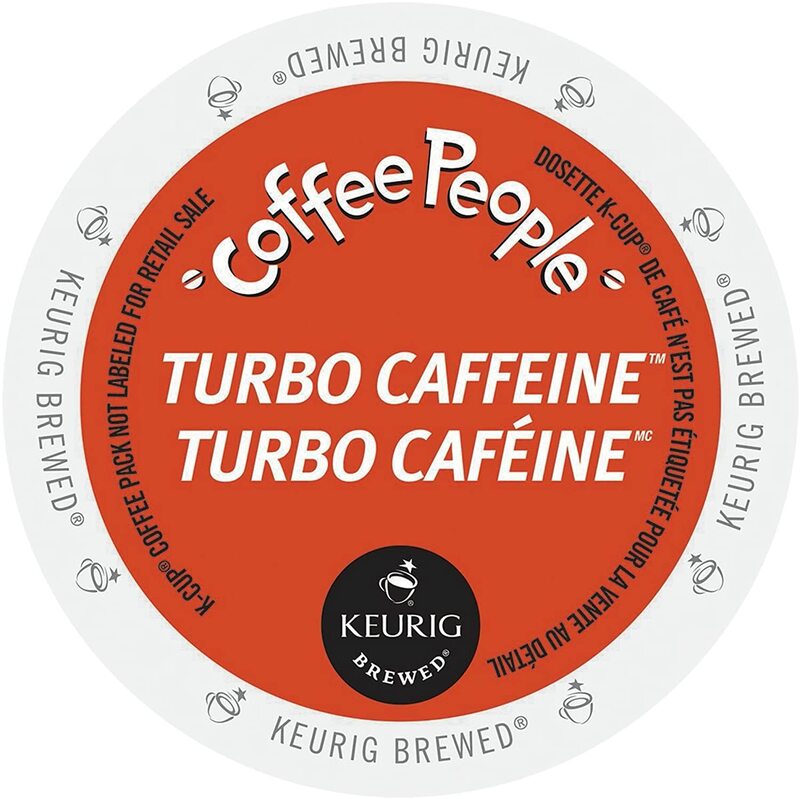 Coffee People used to make the Jet Fuel line of high caffeine, high strength coffee but in 2018 this line was replaced by the Turbo Caffeine line of k-cup coffee pods which has a slightly altered flavor profile but still classifies as and extra bold dark roast that has significan;ty higher caffeine levels than normal coffee grind. Like Death Wish these pods are organic, suitable for Keurig 1.0 and 2.0 machines, and they are delightfully heavy in caffeine despite the dark roast which tends to have less caffeine than light roasts. Coffee people is abrand owned by Keurig Green Mountain so if you want something made by a true third party brand then this won’t be for you but I suggest you give them a try anyway, especially because they have other options in their super strong coffee lineup like the Black Tiger variety which is also labeled as “extra bold”. This is one of my favorite high-caffeine coffees for the Keurig system. Jet Fuel was a super bold coffee that tasted great and now the new Turbo Caffeine is a great replacement. The product even has a lot of top reviews from previous customers. You can usually get the best pricing on Turbo Caffeine in the 96 count box on Amazon here. This is another dark and intense coffee that will remind you of cocoa and brown sugar. It’s really strong, but smooth at the same time. Aside from the subtle undertones you’ll find in this coffee though you’ll also find a super potent flavor at a very reasonable price. In fact the Wild Jo brand of k-cup coffees are much cheaper than either Death Wish or the Coffee People brands noted above and the coffee is not even packaged in cheap plastic cups either. The remarkable difference is that these coffee pods come in eco-friendly, biodegradable materials. The coffee grind in side them is never actually touching plastic meaning your coffee will taste cleaner and will even have a bit more body. These coffees do not contain the highest amounts of caffeine but they are very rich and full bodied in every other way. Wild Jo also is compatible with 1.0 and 2.0 brewers along with other third party branded k-cup brewing machines as well. If you want to give them a look you can see their best pricing on their 96 count box on Amazon here. Also, if you want to try a strong decaf coffee check out their decaf k-cups in medium roast here. Revv coffee has some of the most caffeine per cup as any k-cup sold today. It’s also a fan favorite and a best seller… and it comes in two main “flavors” or blends. My favorite is the AFTERBURNER, linked above but many of our customers prefer the No Surrender variety found here, which is slightly less smoky in flavor or the Turbocharger which is a close second in my book. 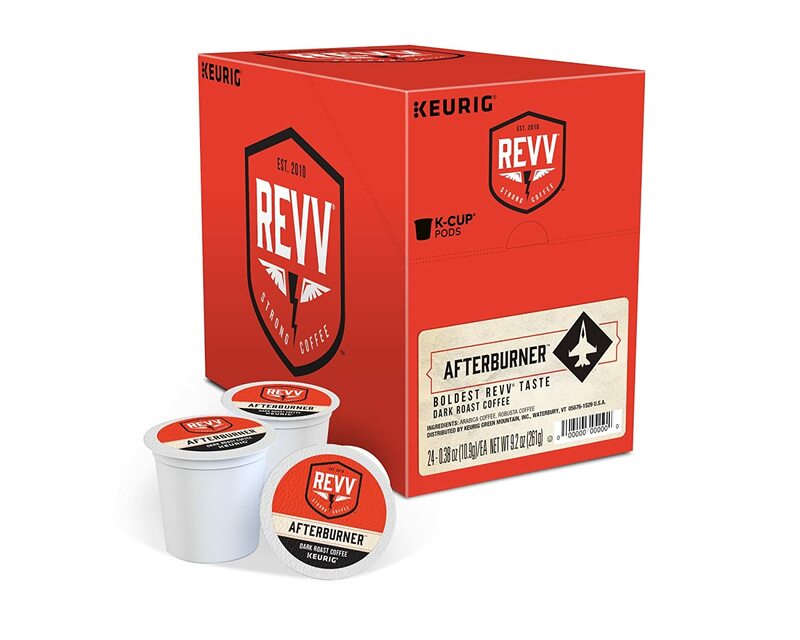 All versions of REVV k-cups are super strong and full of caffeine above what you would normally find in a standard k-cup blend but I find the Afterburner coffee is a little darker (less acidic) in taste which puts it at the far other end of the light roasts in my kitchen. Although I do love light roasts I find the super dark roasts are frequently burnt tasting but with REVV I don’t get that, they really do seem more smooth and charred in flavor rather than burnt, like a finely roasted marshmallow. In any event both REVV k-cups are dark roasted and packaged in cups that work in all standard Keurig machines. What is also nice about them is that they are super affordable like the WILD Jo coffees listed earlier in this article. You can see pricing for the Afterburner here if you haven’t done so yet. 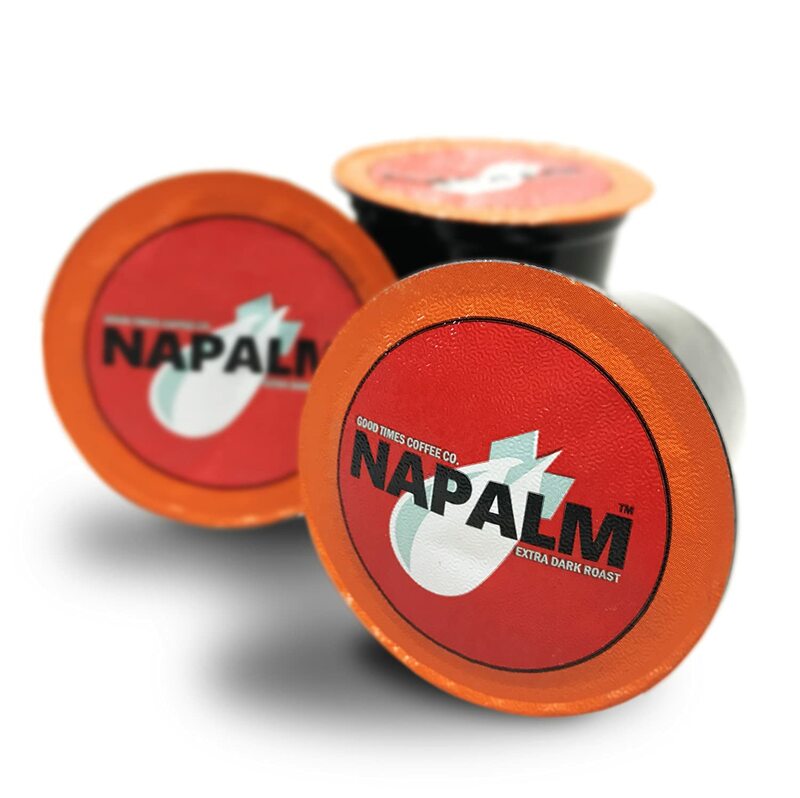 Napalm coffee k-cups are made in the US from 100% arabica beans and they make crazy strong cups of coffee! We like Napalm because it is roasted in small batches like most of the other strongest k-cups available and it’s priced reasonably for it’s uniqueness. Like most of the best selling strong k-cups this is also a dark roast which cuts through the acidity of the bean and brings out that smooth flavor that so many people want in their coffee. Napalm will remind you subtly of chocolate and caramel as you sip and they state that bitterness shouldn’t come through at all! I for one love the acidic flavor of lighter roasts but no roast should be bitter. Keurig machines make this hard to achieve unless brewing the smallest setting but we agree that even with larger brewed cups this coffee doesn’t ever seem to get bitter, just less string as the water volume increases during brew. Napalm costs a bit more than a REVV or WILD Jo listed above but it’s still much lower in price than Death Wish which is why we think it’s worth trying for yourself. You can see pricing for their best priced 72-count pack right here. The coffee pods listed above will get you started in the right place. They are all really strong coffee k-cup options that are hard to beat. If you use them, however, you should know there are still more ways to ensure you get the strongest coffee possible. and by decreasing the grind size (a common way of getting more surface area for better brew extraction). 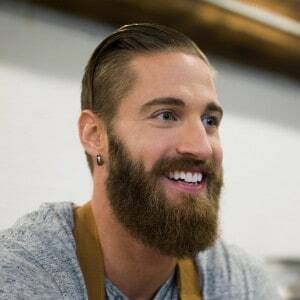 With a Keurig coffee machine, however, you are limited by the temperature of the water the machine uses to brew and are largely limited by the speed at which the machine brews water. Of course if you follow our cleaning and descaling instructions then these factors will at least be working in your favor. You can’t increase the amount of grind in a pod due to them all being uniform in size, and you can’t tamp the grind down to get more grind in the pod either. There are however few easy ways to increase the strength of your Keurig coffee compared to the ways you would do so in more traditional coffee makers. The easiest way you can actually make better and stronger Keurig coffee is to pre-heat the water used for your brew. By this I don’t mean put hot water in the water reservoir, I’m talking about running a “large cup of coffee” cycle through the Keurig that is really just water. Don’t insert a k-cup into the machine. Run it as just water and this will get the heating element hot and the water for the next cup will be a few degrees hotter, which will help with flavor extraction. In other forms of coffee brewing getting the temperature closer to boiling helps and this is the most you can do to get every degree of heat into your Keurig brew. The ultimate effect this has on your coffee will be small but it will help maximize the strength of the coffee you make out of it. Another way to get the most strength out of every cup you brew is to literally only use the first part of the brew and throw the rest away! Sounds wasteful, I know, but the amount of coffee grind that can fit in a k-cup is just not enough to brew a full bodied 6-ounce cup of coffee. You really need a bigger k-cup for that much coffee than the pod size allows. Because of this, the first 4-5 ounces of coffee brewed from each k-cup will be stronger than the last 1-2 ounces of coffee brewed. The water (assuming it’s hot enough) will extract the most flavor in the beginning and the least at the end, while continuing to dilute what you have. Use that drip tray to collect the last, watery bit of coffee and just throw it away. You wouldn’t brew coffee twice using the same grounds, so don’t try to get more coffee from a pod that is just too small. Now, there are craftier ways to increase the strength of your Keurig coffee pods if you care to dinker around with the actual k-cups. Filling more grind into a k-cup will go a long way towards making a better cup of coffee but some cups can be hacked easier than others and even then the size of the cup is the main limitation and that can’t be altered if you want it to fit in the machine. If you are brewing with a Keurig 1.0 machine, it’s a little easier to hack your own pods to get more grind inside them, but even with a Keurig 2.0 machine you can still “trick” the machine into using your own pods that may contain a weightier fill. Instructables has a good tutorial on hacking your own pods. For me, this is overkill and defeats the purpose and convenience of the Keurig system. If you want to spend time filling (or hacking) k-cups why wouldn’t you just brew coffee with a more manual method like drip, pour-over, or even stovetop moka?!? When I think about brewing strong Keurig coffee I always find the ease of pulling your cup out before the brew cycle ends to be the simplest and most effective method. Pair this with using a descaled and pre-heated Keurig and an extra bold pod in the brew chamber and this is about as good as you can get. If you want any more strength, then just do what everyone else does… start brewing with a French press or some other manual device that gives you more control over the process! Make sure to see our guide to deep cleaning your Keurig too! A clean Keurig will give you a stronger and better tasting cup of coffee.